Bert here! Are you looking for a buddy? I’m your guy! 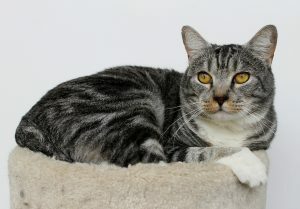 I’m a gorgeous and super friendly 6-year-old male kitty who is very easy-going. I came to Pixie recently and quickly became a favorite because of how social and mellow I am. They have me in the cattery where I live very peacefully around some super rambunctious kittens — but they don’t phase me! My favorite hobbies include sleeping in the sunshine, nuzzling on friendly visitors, and generally being a sweetheart. 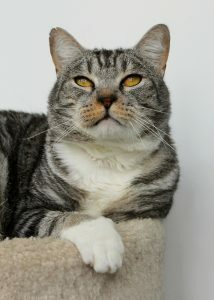 I would do great in a home with other cats or kids, and have been non-reactive around dogs. I’m just a round, rolly-poly guy looking for someone to be the Ernie to my Bert! Are you interested? Stop by Pixie today to meet me! I come to you neutered, vaccinated, and micro-chipped for an adoption fee of $100.